Drop the needle on the brand-new 45rpm platter by The White Blinds, a cover of Sly Stone’s Sing A Simple Song. We love those 7inch babies, a format tailor-made for a powerhouse trio like The White Blinds, which while thoroughly up-to-date, harks back to the halcyon soul jazz days, when every joint had a jukebox and Curtis Mayfield, James Brown and a slew of hip and funky organists were the saints that soothed the souls of folks in the hood. 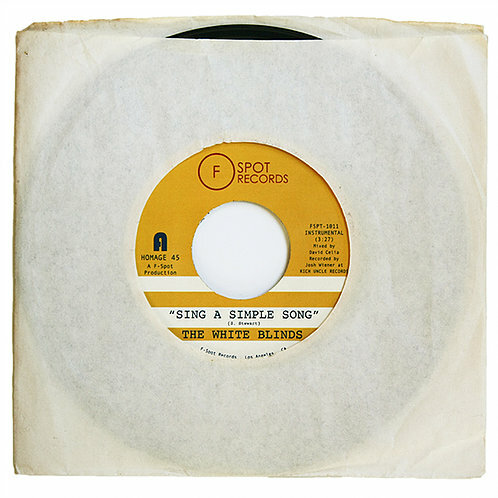 The release of Sing A Simple Song/Klapp Back is part of the Homage Series of Los Angeles-based F-Spot Records. The White Blinds are drummer Michael Duffy, organist Carey Frank and guitarist Matt Hornbeck. The Hammond groove outfit, one of the most prolific organ combos on the West Coast, is a greasy, well-oiled rhythm machine whose version of the flower power funk classic Sing A Simple Song does justice to both Sly & The Family Stone and Charles Earland, the organist known as The Mighty Burner, who presented his killer version on the 1970 Prestige album Black Drops. The trio’s heavy groove is sustained by precise and powerful drum patterns and breaks, tantalizing New Orleans Funk guitar licks and full-bodied chords and hypnotizing organ lines, which add a drop of acid in a refreshing glass of lemonade. Side B’s Klapp Back is penned by The White Blinds and marked by a similar tight pocket, as well as a streetwise conversation between Frank and Hornbeck that works well as the introduction to Frank’s solo, which is all crunchy and screaming Hammond B3. Both tunes would work well as the introduction to The White Blinds. Find Sing A Simple Song/Klapp Back on F-Spot Records here. Gritty, entertaining and thoroughly modern. Saxophonist Nick Hempton’s Night Owl keeps the flame of organ combo jazz burning brightly. Nick Hempton has been a fixture on the New York scene since 2004. Besides notable cooperations with Roy Hargrove, Joe Magnarelli and Peter Bernstein, the Australia-born tenor and alto saxophonist has released five albums as a leader, four of which were recorded with the Nick Hempton Band, a group that brought him to venues and festivals around the globe. Cherishing a particular passion for classic 60’s organ jazz, Hempton has finally come around to produce a full-blown session of the archetypical format of sax, Hammond organ, guitar and drums. Assisted by guitar maestro Peter Bernstein, organist Kyle Koehler and drummer Fukushi Tainaka, Hempton presents a set of blues-based original tunes like the shuffle grooves Night Owl and Macao Mood, boogaloo-ish Corner Bistro, the Latin-tinged tune I Remember Milady, the greasy backbeat-driven Listen Hard, Speak Easy and ballads I’m A Fool To Want You and It Shouldn’t Happen In Dreams. Night Owl is a hot barbecue, its smells mingling with chatter and claxons on the corner of Lexington & 110th Street, neon signs keeping an eye on the hustlers, smoke rings swirling around the customers of the dingiest bar uptown, sax wailing… The nightlife, it ain’t no good life, but it’s my life… The album combines barroom excitement with modern jazz finesse, the blend that is the prerequisite for first-rate soul jazz. The sax playing of Hempton is firmly on the forefront and shades of Stanley Turrentine, Dexter Gordon, Lou Donaldson and a sleazy and husky bite complete the accessible style that is all Hempton’s own. Bernstein is his customary crystalline, slightly angular yet melodic self, Koehler is a lively, tasteful player and Tainaka’s accompaniment is meaty and swinging – Tainaka’s resume includes stints with Lou Donaldson, Lonnie Smith and Melvin Rhyne. At one time, during After You’ve Gone, the band’s flow might remind you of the fluent bop groove of Sonny Stitt’s organ group with Don Patterson. Stitt, by the way, followed a long line of interpreters of the composition like Duke Ellington and Charlie Parker. Like his forefather, Hempton is the kind of guy that devours the harmonically active changes. A moment later the quartet delivers a slice of touching balladry. Hempton’s sweet-tart take on It Shouldn’t Happen In Dreams, subtle shifts of the beat underlining heartbreak and a sense of foreboding, is the mark of a thoroughly mature jazz musician. 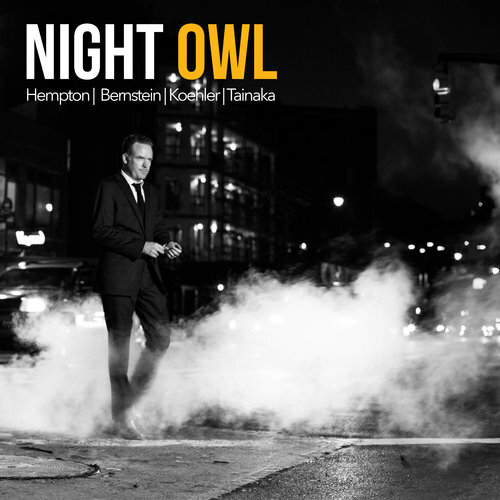 Night Owl is highly entertaining evidence of Hempton’s flexible and passionate approach of organ jazz. Find Night Owl on Amazon here. Check out Nick Hempton’s website here. If you haven’t already, do sign up with SmallsLive. The jazz club is vital to the fabric of jazz, decent and passionate owners integral to its survival as a spontaneous art form. Smalls in New York City is a good’n. Smalls was founded in 1994 by Mitchell Borden and has been a breeding ground of many figureheads and talents of modern jazz as Peter Bernstein, Ari Hoenig, Mark Turner, Norah Jones, Brad Meldhau and Chris Potter. Since 2007, the jazz club at 183 W 10th Street in Greenwich Village, New York City, has documented all performances at the club, audio since 2007 and video since 2011. The performances are up for view through live streaming and past gigs can be searched in the archive on the website. Free streaming is available but there are different options for sponsorship as well. SmallsLive is a unique concept that preserves first-class performances for posterity, directly benefits performing artists through royalties and stimulates the contemporary jazz landscape in New York City. Check the history of Smalls here. Legendary Dutch bop pianist Rein de Graaff combines his forthcoming farewell tour with the release of a brand-new album, Early Morning Blues. Yes, that’s the bad news: De Graaff is retiring as a professional jazz musician. The good news: fifty years after his recording debut, the Groningen-born De Graaff delivers a jazz album that serves as but one example in his discography of the man’s masterly involvement in bebop and straight-ahead jazz. Self-acknowledged part of a small coterie of Last Of The Mohicans, De Graaff is of the opinion that straightforward jazz is hard to come by these days. No doubt, the fruitful, pre-crossover mainstream jazz landscape of the seventies and eighties, including countless playing venues and American legends carrying the flame, is by and large a thing of the past. Yet, considering the crowds that De Graaff has still drawn post-00, perhaps mostly consisting of elderly fans but also of a fair amount of youngsters, evidently the bop master has still inspired jazz aficionados and passed the peas to aspiring musicians one way or another. I was present at a rare jazz café appearance of De Graaff recently in The Hague – the 77-year old pianist usually appears strictly in jazz clubs and theatres – and noticed more than a few young lions eager to soak in everything De Graaff conjured up from the upright piano. To be sure, De Graaff has always made it his business to feature exceptional young talents on his tour schedules. At said café Pavlov, De Graaff’s playing was remarkably fresh and energetic. Few human beings are as composed and level-headed as Rein de Graaff, who during a remarkable career as a leader and accompanist of countless legends like Dexter Gordon, Dizzy Gillespie, Hank Mobley and Johnny Griffin also was the owner of an electro ware wholesale company. His straightforward personality is reflected in logical phrases and musical stories. However, the blues and a certain edge are consistently present. Most likely, De Graaff has always reserved the fiery and sleazy side of the soul for his horn-like piano style, which was inspired so long ago by the work of Charlie Parker, Bud Powell, Hank Mobley, Lee Morgan, Hampton Hawes, among others. Plenty of fire in the set of Early Morning Blues, which typically consists of standards and a couple of originals and contrafacts that are tailor-made for the tasteful, long-lined stories of De Graaff. It ranges from evergreens as Dear Old Stockholm, Avalon, Fly Me To The Moon and the unaccompanied Little Girl Blue, ballads that were transformed into bop anthems by Charlie Parker like Don’t Blame Me and Lover Man, bebop compositions as George Wallington’s Godchild and Benny Harris’s Wahoo and, finally, the De Graaff compositions These Are The Things, Early Morning Blues (The album features two takes of the down-home, supple slow blues) and Moonology. The trio interaction is marvelous. 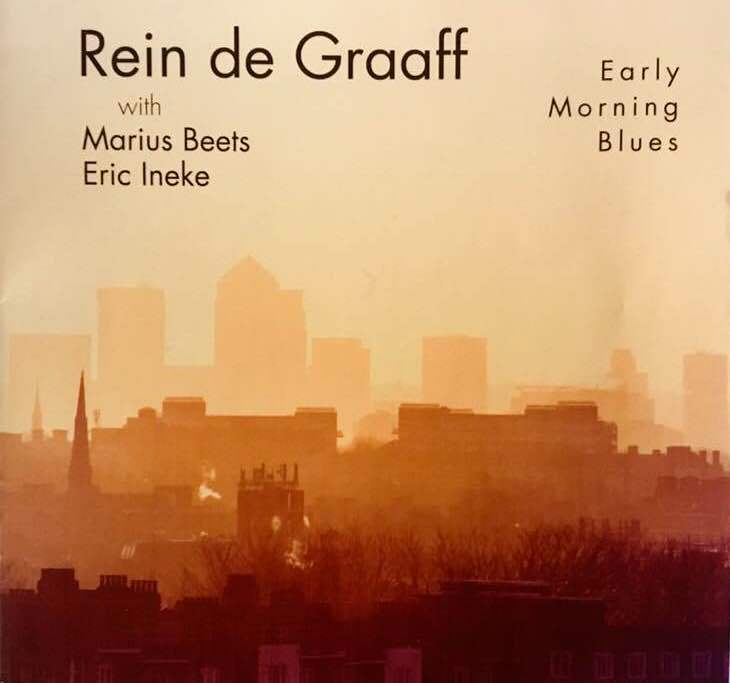 European master drummer Eric Ineke has been De Graaff’s partner-in-swing for nearly fifty years, bassist Marius Beets is a versatile modern jazz man whose pocket and immaculate choice of notes reveal a passion for Ray Brown and has been with De Graaff since 1999. Multiple examples of the group’s striking flexibility are available, Avalon and Dear Old Stockholm being particularly enchanting. Nowadays one would be hard-pressed to find the kind of cocksure and authoritative introduction of a tune like the trio’s uptempo version of Avalon. The concise combination of drum rolls, bass patterns and quicksilver piano lines is like a shot of classic jazz, like hearing for instance, filtered through their distinct personalities, bits of Sonny Clark’s Trio LP with Paul Chambers and Philly Joe Jones. De Graaff’s sophisticated harmony and Ineke’s flexible approach of the beat considerably refreshes Dear Old Stockholm. It allows De Graaff the kind of freedom within a fixed set of changes that the pianist has always been comfortable with. In this respect, De Graaff’s daring variations on the melody of Lover Man speak volumes. Right until the very end, the Rein de Graaff Trio is seriously takin’ care of business. Find Early Morning Blues at your local music store and De Graaff concerts. Liner notes by Steven A. Cerra. Check out the schedule of Rein de Graaff’s Farewell Tour below. His regular trio of Marius Beets and Eric Ineke will be augmented with saxophonists Benjamin Herman, Maarten Hoogenhuis, Marco Kegel and Tineke Postma. Special guest: baritone saxophonist Ronnie Cuber. Organist Lou Bennett’s popularity in Europe has always been much bigger than in the United States. Bennett was born in Philadelphia in 1926, a pianist who took up the organ after seeing Jimmy Smith in 1956. Before he was able to gain a foothold in the USA, Bennett migrated to Europe in 1960. His first album, Amen!, a cooperation with fellow expat and drummer Kenny Clarke, got him off to a good start. Bennett gained a large following in France, recording and performing regularly. He lived in Paris and Spain and passed away in 1997 in the little town of Le Chesnay just outside Paris, France. Bennett smoothly mixed a thorough bebop proficiency with his gospel roots. He is also recognized as one of the greatest players of the bass pedals and of the inventor of the Bennett Machine, a pioneering hybrid of electronic devices and the Hammond organ’s construction. During one of those half hours in between surfing on YouTube that all fans of music are familiar with, I stumbled upon interesting footage of Lou Bennett on YouTube. Hear Bennett in Paris with guitarist Elek Bacsik and drummer Franco Manchetti, performing Brother Daniel. With drummer Kenny Clarke performing Tadd Dameron’s Lady Bird. And performing Zonky, Satin Doll and Broadway with Kenny Clarke, guitarist Jimmy Gourley and the incomparable Brew Moore at the Blue Note Club in Paris, France in 1961 here. More on Bennett coming up this month in Flophouse Magazine. Stay tuned! Bassist Joris Teepe has been living and working simultaneously in New York and Amsterdam since the 90s. As the only Dutch jazz musician of his generation, Teepe has enjoyed a fruitful career on the American scene. He has performed and recorded with, among others, Benny Golson, Slide Hampton, Charles McPherson, Harold Mabern, Billy Hart, Eric Alexander, Tom Harrell, Peter Bernstein, Mulgrew Miller and Randy Brecker. More and more, Teepe leaned to avant-garde jazz, particularly under the influence of drummer Rashied Ali. Rashied Ali was one of the big free jazz drummers. He is perhaps best known for his cooperation with John Coltrane on Interstellar Space. Teepe was part of Ali’s group from 2001 till 2009, when Ali passed away. His robust yet silken tone and fluid style keeps Teepe in high demand. Now the bassist and composer has released the booklet and album In The Spirit Of Rashied Ali, a dedication to his mentor that also features saxophone players Wayne Escoffery, Johannes Enders and Michael Moore, guitarist Freddie Bryant and drummer John Betsch. The thoroughly instructive and well-designed booklet is written by John Weijers. This was the common practice of a kind of neighborhood extortion by the Ma a in New York City at the time. In The Spirit Of Rashied Ali is released by Jazz Tribes. It is available on Amazon. Check out the website of Joris Teepe here. Just when you think how in the hell are the guys from Bruut! going to keep it fresh after all these years, they turn in V. Their fifth album, and their grittiest. These guys may not look like a couple of greasy workers diggin’ potatoes. Instead, they are some of the sharpest dressers on the scene. But if not dirty on first sight, saxophonist Maarten Hogenhuis, organist Folkert Oosterbeek, bassist Thomas Rolff and drummer Felix Schlarmann got soul of a strangely twisted kind. In their universe, marriages are celebrated between boogaloo and power pop, post-punk and mood music, perhaps even Link Wray and P.J. Harvey. If a pop band would try its hand on this kind of crossover music, it would most likely be unconvincing. But Bruut! consists of accomplished jazz musicians and each member adds his particular talent and vibe to the palette of entertaining NU-soul jazz. The wedding party likely takes place in one of those seedy East Hollywood strip clubs frequented by a dozen or so Tom Waits impersonators and the lady that makes a rather charming impression despite the blue bags under her eyes, Botox breasts and stale perfume dating back to the era during which E.T. was in the pre-production phase. Or it might be held at one of the trashy jetset places one always reads about in the tabloids and is never able to attend. Whatever spot it might be, the fat, resonant bottom of drums and double bass is perfect foil for Hogenhuis and Oosterbeek. The alto and tenor sax of Hogenhuis sounds raw, like a distorted Varitone sax, and Hogenhuis regularly hams it up like a disgruntled hooligan on ketamine. His timing is immaculate and he allows himself a number of solo spots and ad-libs that demonstrate an apparent admiration for Eddie Harris. Oosterbeek provides crunch and edge with all kinds of keyboards like the Hammond, Korg, Vox, even Harmonium. Angular hooks that are groovy and jazzy but also part Queens Of The Stone Age part Pogues part B52’s are enlivened with frivolous bridges and underscored by varying, hefty beats from Schlarmann. As a breather, Hogenhuis contributes his customary mood pieces that showcase his liquid silver tone and melodious lines. 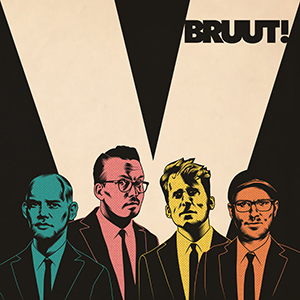 As usual, Bruut!’s song titles consist of only one word. Lopez. Bud. Maestro. Klets. Peewee. Part of the group’s identity that is crystal clear and hasn’t worn. Posted in Talkin' about	- Tagged Bruut!